BlastOff Bunnies is another point and click launch game created by agame. 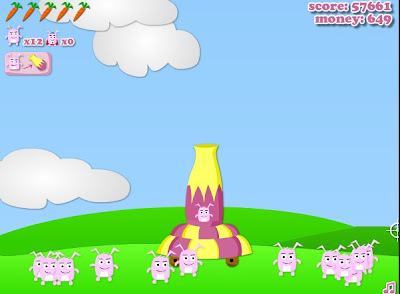 In this game, you are to blast into space as many bunny rabbits as you can. Collect cash and other power ups as you shoot up a bunny up in the air. Use the money to buy upgrades and other items such as cannon after every round. There are 9 achievements in this games namely, Mars Bunny, Jupiter Explorer, Exploration Saturn, Deep Space Bunny, Deep Space Family, Flight for Money and King of Bunnies. Meanwhile, let's watch this Blast Off Bunnies walkthrough showing how to get the easiest medal - Kiss from the moon achievement.